The more astronomers are studying ‘Oumuamua, the more mysterious it gets. Now, astronomers have discovered that this alien visitor, which most likely originated in a distant alien solar system, has a protective layer rich in organic matter that has helped preserve the asteroid and the vaporization of its interior ice. Since the object was discovered in October, Alan Fitzsimmons and Michele Bannister, from the Faculty of Mathematics and Physics at Queen’s University Belfast, have led an international team of scientists in order to find out as much as possible about it. The mysterious asteroid has been called out as being an alien space probe with broken engines by astronomers who have even scanned it with powerful telescopes, hoping to find traces of alien technology. Despite this fact, ‘Oumuamua is regrettably—or luckily depending on how you think of aliens—not an alien probe with broken engines. It is just a weirdly-shaped asteroid traveling at nearly 200,000 miles per hour through our solar system. 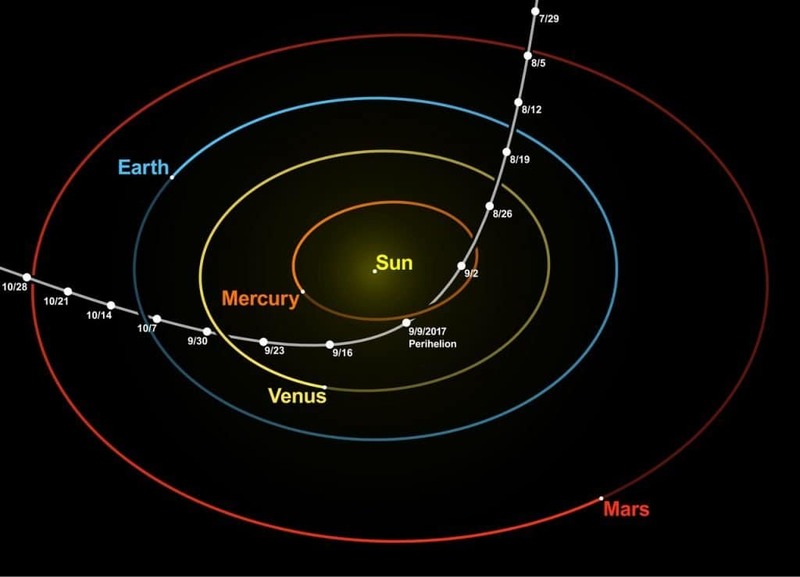 The hyperbolic trajectory of ʻOumuamua through the inner Solar System, with the Sun at the focus, showing its position every seven days. The planet positions are fixed at the perihelion on September 9, 2017. Shown from a three-quarter perspective, roughly aligned to the plane of ʻOumuamua’s path. Astronomers have found that ‘Oumuamua reflects sunlight and found it to be similar to other frozen objects covered with a dry crust. AStronomers say that this is due to the fact that ‘Oumuamua has been exposed to cosmic rays for millions, or even billions of years, which helped create an insulating layer rich in organic matter on its surface. 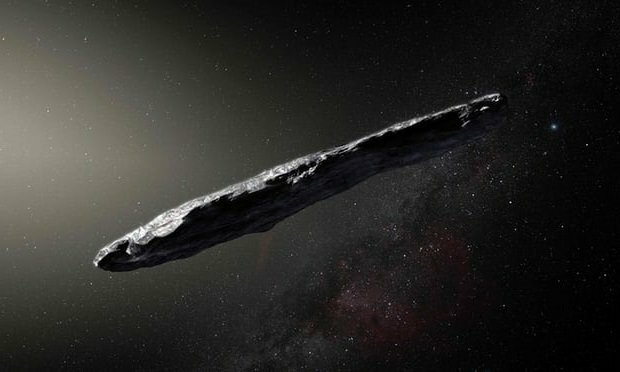 The study, detailed in the journal Nature Astronomy, explains that the dried crust of ‘Oumuamua helped protect its icy interior from being vaporized, despite the fact that the mystery object was 23 million miles from the sun in September. “We have found that the surface of ‘Oumuamua is eerily similar to other small cosmic bodies in the solar system that are covered with carbon-rich ice, whose structure is modified by exposure to cosmic rays,” emphasizes Professor Alan Fitzsimmons. Dr. Michele Bannister and her team observed `Oumuamua while still within range of the world’s largest telescopes, and their findings will be published in ‘Astrophysical Journal Letters’ later this month. They discovered that the object was the same color as some of the smaller frozen planets that had been studying outside of our solar system, which implies that different planetary systems in our galaxy contain smaller planets like ours.